Poroshenko Says Ukraine Near To 'Full-Scale War' : The Two-Way Speaking at a meeting of European Union foreign ministers, the Ukrainian president says Kiev is "close to the point of no return," over Moscow's direct support of separatists. 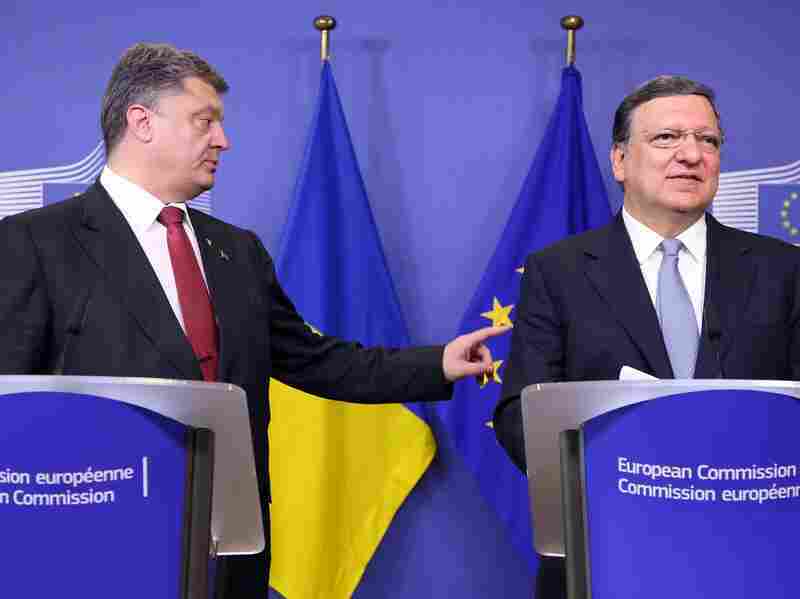 President of Ukraine Petro Poroshenko (left) and EU Commission President Jose Manuel Barroso during a news conference after a meeting at the EU Commission headquarters in Brussels on Saturday to discuss the crisis in eastern Ukraine. Ukraine's President Petro Poroshenko has told European Union foreign ministers that his country is "close to a point of no return," over Moscow's support for separatist rebels. "I think that we are very close to the point of no return," he said at an EU meeting in Brussels, where he was invited to speak. "Point of no return is full-scale war," he said. "Any offensive action which would be undertaken [by Russia]... would be a point of no return. And that's why we undertake enormous efforts to stop that," he said, according to the BBC. The Ukrainian leader's comments came as the EU was reportedly hammering out further sanctions against Russia. European Council President Herman Van Rompuy said the EU would have proposals for sanctions within a week, the Associated Press reported Saturday, although it's not clear when those sanctions might be implemented. These potential sanctions would be intended to punish Russia for its incursion into eastern Ukraine, where as many as 5,000 Kremlin troops are said to be fighting alongside pro-Russia separatists. The European foreign minsters have expressed "deep concern" over Moscow's "aggression." NATO has also called on the Kremlin to halt its "illegal military operations" in eastern Ukraine. Meanwhile, pro-Russia separatists have captured the Ukrainian city of Novoazovsk in the southern Donetsk province on the coast of the Sea of Azov. NPR's Soraya Sarhaddi Nelson, who visited Novoazovsk shortly after its capture, tells Weekend Edition Saturday that the city seems calm, but that residents are nervously reticent. In an hour-long visit that was controlled by separatists, Soraya says she spoke to a city administration worker. "She was rather frightened and it took me a while to even get her to give me her first name," Soraya says. "I asked her if she was happy that she'd been liberated and she wouldn't answer." The capture of the city, now part of what the separatists call "the new Russia," came after three days of fighting, according to residents. Soraya tells Weekend Edition Saturday host Scott Simon that it's difficult or impossible to tell whether Russian forces are mixed in with the rebels, as the U.S. and European nations claim. "[There] seems to be a mix of people here, definitely not locals who are here," she says. "But the separatists claim they do not have any Russians fighting among them, that these are Ukrainians fighters who are here ... that all the weapons and tanks here, and we've seen three tanks here, have been confiscated from the Ukrainians." According to the AP: "None of the half-dozen tanks seen by Associated Press reporters in the town of about 12,000 people bore Russian markings, but the packaging on [the fighters'] field rations said they were issued by the Russian army." NATO Secretary-General Anders Fogh Rasmussen on Friday referred to Russia's "hollow denials" that its troops and equipment had illegally crossed the border into Ukraine. "This is a blatant violation of Ukraine's sovereignty and territorial integrity. It defies all diplomatic efforts for a peaceful solution," he said. Earlier this week, President Obama said there is "no doubt that this is not a homegrown, indigenous uprising." "Referring to meetings in Brussels between Poroshenko and EU leaders on Saturday, the spokesman said: 'Poroshenko expressed the hope that the leaders of EU members will give an appropriate response to the act of aggression towards Ukraine. "'The bringing of Russian forces onto Ukrainian territory requires an appropriate response from the EU.'" The high-level discussions came amid reports that a Ukrainian SU-25 had been shot down. Soraya reports: "This has been the third jet that in recent days has been shot down. This time, the Ukrainians say it was some sort of Russian missile launcher that brought it down. There has been no response from the Russian side."